James Wilde’s thrilling, action-packed debut rescues a great English hero from the darkest of times and brings him to brutal and bloody life. "James Wilde’s début novel is fantastically realised. There are strong, believable characters, lashings of fast paced action but this is matched by some excellent intrigue and betrayal that helps to keep the plot moving forward. 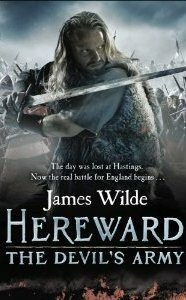 Hereward is a great example of the historical fiction genre. I recommend it highly." "All in the story moves at a wonderful pace, the combat is clearly thought out and with Howardesque touches, great swathes of bloodletting and overall kickass arc; it’s a title that for a debut will make one hell of an impact to the Historical Fiction audience which makes Wilde an author to keep an eye on"